� These tales from legendary writer Archie Goodwin focus on The Dark Knight as a hero who stands against the monstrous forces of the night. Includes the Manhunter saga, which culminates in a Batman team-up. 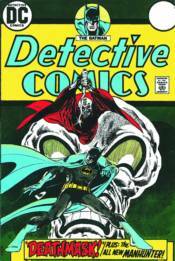 � Collecting DETECTIVE COMICS #437-443, DETECTIVE COMICS ANNUAL #3, SHOWCASE '95 #11, LEGENDS OF THE DARK KNIGHT #132-136, BATMAN: NIGHT CRIES and BATMAN BLACK AND WHITE #1 and 4.